Perestroika brought monumental changes to Soviet Russia. On August 19, 1991 something extraordinary occurred in Moscow. A group known as the General Committee on the State Emergency (GKChP) staged a coup while the president of the Soviet Union, Mikhail Gorbachev, was on vacation in Crimea. The coup, however, failed. In response, thousands of Muscovites poured onto the streets to protest, setting up barricades to halt the army tanks commanded by the GKChP. Soon enough the soldiers sided with the protesters, and the GKChP backed down. Gorbachev had them arrested, including his own vice president. Just days later, on August 24, Gorbachev dissolved the Central Committee of the Communist Party of the Soviet Union. This, in effect, dismantled the Communist Party itself. The Soviet era was brought to a close. But it didn’t all happen in a flash. The dissolution effectively represented the culmination of what was known as perestroika, a period of unprecedented reform in Russia. Let’s step back a bit. Perestroika had begun around 1985. Gorbachev had triggered reforms, releasing political prisoners as well as loosening restrictions on freedom of the press and speech. Just imagine: in a vibrant city like Moscow, it must have felt like the clouds were lifting. Banned books were finally published. It seemed like the dawn of a new humane socialism. In this spirit, the atrocities of the Soviet prison camps were also revealed. But Russia is big, and it certainly wasn’t just made up of Muscovite city slickers. Most people lived in villages and held their Communist values close to heart. 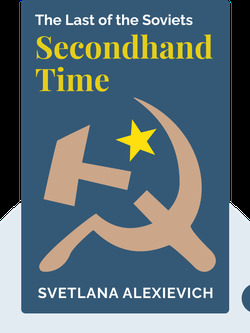 But neither side of the divide, no matter their opinions on perestroika, could have predicted what happened after the coup and the dissolution of the Communist Party. Instead of evolving into a humane socialism, the country veered headfirst and unprepared into a quite different world: capitalism. Even today the effects of perestroika divide Russians. Suicide was not unheard of as Communism collapsed. People were even willing to endure imprisonment and torture for Communism. Soviet Russia was a state based on informants and a code of violence. A series of bloody conflicts followed the end of the Soviet era. If one thing hasn’t changed since Soviet times, it’s the strength of the militaristic authorities. Start your free Blinkist trial to get unlimited access to key ideas from Secondhand Time and over 3,000 other nonfiction titles. With bitesize text and audio, it's easier than ever to find the right ideas to transform your life.